The crew and I are enjoying ourselves here at Dome Rock, Quartzsite, Arizona! People who own fiberglass egg campers are an easygoing lot. Yesterday we roasted hot dogs over the communal campfire. I still haven’t gone shopping yet. We’re having too much fun at the campsite! As the day progressed the weather turned dreary and chilly, so we didn’t feel like walking around Q, instead we cozied up in our eggs or in Chuck and Geri’s “Mothership.” That didn’t last long as we were soon out together again watching the clouds turn pink as the sun slid behind the mountains. Do you see the Perfect Tow Vehicle and the Perfect Little Trailer? Now do you see our house? Get the mustard and relish! 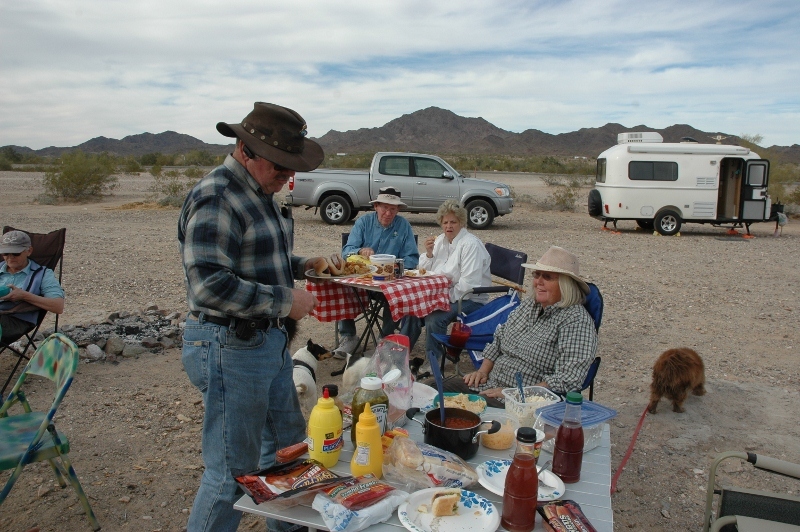 This entry was posted in Getting Ready To Go, Simple living and tagged Arizona, campfire, camping, dogs, Dome Rock, Quartzsite, RV. Bookmark the permalink. Looks like you guys are having a blast! This is a great group of people! and dogs! Thank you, Darrell. You’re absolutely right. I can be me all day long. I didn’t know more eggs were on their way. I hope you have a great time here. I’ll be posting more photos . . . Wonderful pictures!!! Great to see you having a good time. You cooked those hotdogs just the way I like them….charred on the outside. 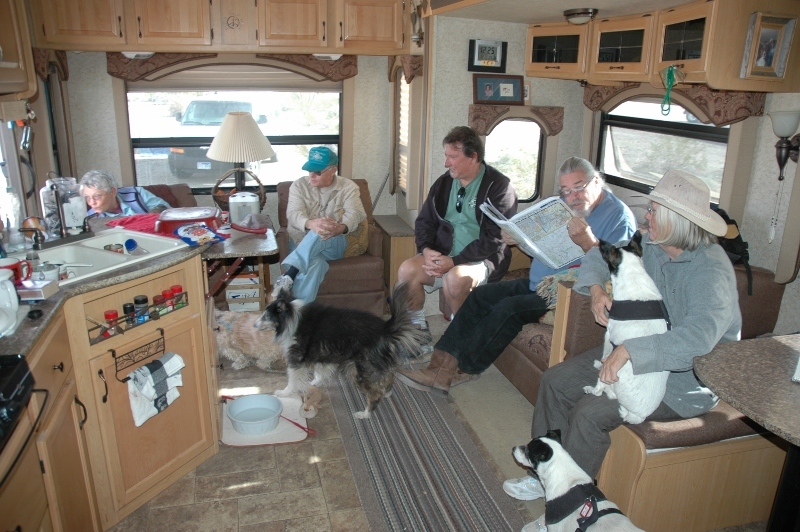 It looks like everyone is having such a fun time….even the canine rvers. I cooked those dogs in a big hurry. Most of these folks are from California or Oregon and I’m still on Arizona time . . . I thought we’d never have lunch! Boy, what a motley looking crew and bunch of houndz!!! Only one REAL CAMPER in the whole lot; the rest are all bundled up with hats and all!! Spike better behave hisself, therez a couple there that could eat him, unless they’re ‘gurlz’, then they’d ‘lick’ him for sure, lick,lick,lick,lick!!!!! When you open the pic up and look in the background; there are white spotz all over the place! I always thought the desert was a lonely place!!! Looks like you are in your element!!!!!!!!!! Just think…… IT AIN’T EVEN STARTED YET!!! HAVE A BLAST!!! What are you talking about . . . white spots? What pic? No, it’s not lonely around Quartzsite! The “scheduled” Casita RALLY is Feb 10-12. It would be worth sticking around to meet Gene, the CasitaForum Webmaster and several other folks that post on the CasitaForum including some of the solo female campers. We want to go to Q but have other responsibilities and destinations first. Maybe next year. I was worried I might miss the gathering I aimed for, so thanks for reassuring me, Reine. The camp site reminds me of a mother hen and her chicks all scatter around. Little white leghorns! That’s why Chuck and Geri call their fifth wheel the Mothership, because she’s surrounded by white satellites. Hi Sue … I will more than likely be purchasing a Casita next weekend … where do you find the rallys and gatherings? As a soon to be solo female camper, would love to find a safe fun group of people to hang with and just relax. I’ve never owned an “egg” but sometimes things just drop in your lap and you gotta run with them huh? Owner approached me knowing I was looking for a small camper and had had such horrible luck with aluminum ones so this will likely be my new thing. If you could direct me to the forum and the group, that would be awesome (if you accept new and somewhat clueless wannabe eggers that is! Mary, you should bookmark kamperbob.com/eggcentral since Egg Central just links to lots of web sites that may interest you. Do searches for the word “Casita” or “fiberglass rv” and “solo rving” or “women rvers” and you’ll find lots of good websites/forums/blogs. Try capita forums. You’ll find it easy on google. Sue – What fun you are having. The circle arrangement of “eggs” reminds me of a modern version of the ole TV show, Wagon Train. You aren’t packing a pistol are you? 2nd thought, maybe that would be a good idea. Keep enjoying the enjoying !! I am glad you posted the pictures, they give a real feel of what it is like to camp there with a group. Funny, it seems you really enjoy being with others, more so now than ever. Could it be because you aren’t forced socialize at least 40 hours a week anymore now that you are retired? Or is it that you are now with your kind of people? Or both? Anyway, keep up the good blogging! You probably have figured me out. I think I can enjoy these people because they aren’t pushy . . . I can retreat to my Casita at any time . . . I don’t have to go on their outings if I don’t want to . . . Plus I just had over a week of alone time. I like to hear that my photos help you imagine what it is like here. Sue, glad to see you made it to Q in fine shape! I will be avidly watching your posts. I have only been thru that area on the way to California over the years and never in winter. I guess I have missed all the “comotion”…. anyway you will be my eyes You know, when we moved from Cambridge to Phoenix I will never forget the first time I saw the desert. I hated it!!! Now it has been many years and I have loved it for a long time now. Be safe and enjoy yourself! Wish I could send some clear weather your way, but it won’t be this dreary for long. The desert grows on you, for sure. It doesn’t stay dreary. . . every evening the sky has lit up with pink clouds, so pretty. Thank you, Becky! I am having a great time. Sure looks like fun! I went all over the huge Tampa RV show looking for Casitas so I could sit in one and be RV Sue for a day ;-). The show didn’t have even one. Where do you guys find these things?? No problem, Bob. I’m not territorial. Casitas aren’t displayed at rv shows. If you want to see a Casita, either you go to the factory in Rice, Texas, or you call them up and they give you the name and number of a Casita owner who will show you their rig. Sherry, another way to see Casitas is to go to CasitaForum.com and check out the “Rallies and Campouts” forum to find a rally that’s near you. Generally we welcome prospective owners who want to get a closer look. Fiberglassrv.com also has a rally list. Casita folks by and large are a friendly bunch and are usually glad to show off their Casita. You are having way too much fun with all your egg people at Quartzite. I’ll bet you don’t know that a lot of your other friends are just down the road having their Annual Rubber Tramp Rondeveaux (remember the other forum – cheaprvliving.com) you don’t have time to visit? Thanks for all your travelogues, it’s still cool to follow you and the crew. Well, I was wondering about that! There’s a sign on the dirt road in front of our area that says Rubbertramp on it. . . I didn’t know if it was THE Rubbertramp group. I’ll see if I can find them. Thanks, Bob! The only thing better than an Egg is a NAKED Egg! Did you notice that guy on the left in the photo with the silver pickup? His Casita has no decals! Wonder why? Sounds like you are having more fun that even YOU expected. I was worried that you would become overwhelmed with all that craziness, but after all, you can go back into your SHELL (ha-ha) any ol’ time! Still obsessing on the heater. Do you have it on all night these days? Gayle, The trailer I think you’re talking about isn’t a Casita . . . It’s a vintage trailer, don’t know the brand. I thought Quartzsite might be too much, too. As it turns out, these people are a lot like me . . . They don’t race around trying to DO stuff all the time. A lot of hanging around the campfire. .. looking at each other’s eggs and how they’ve been adapted . . . and of course wandering around the vendors and shopping . . . I ran the heater all night the last two nights, but I didn’t really have to. One reason was Spike. He was achy from running around all day and I thought the heat would be good for him. I could have turned it off after running it for an hour or so before turning in. And I didn’t want to wake up to a chilly house, so I kept it on. Tonight I don’t think I’ll turn it on at all. The sun’s been down for a couple hours and it’s not that cold inside. Actually. Clete and Chris’s Casita was a “naked” Casita…. no markings of any kind! 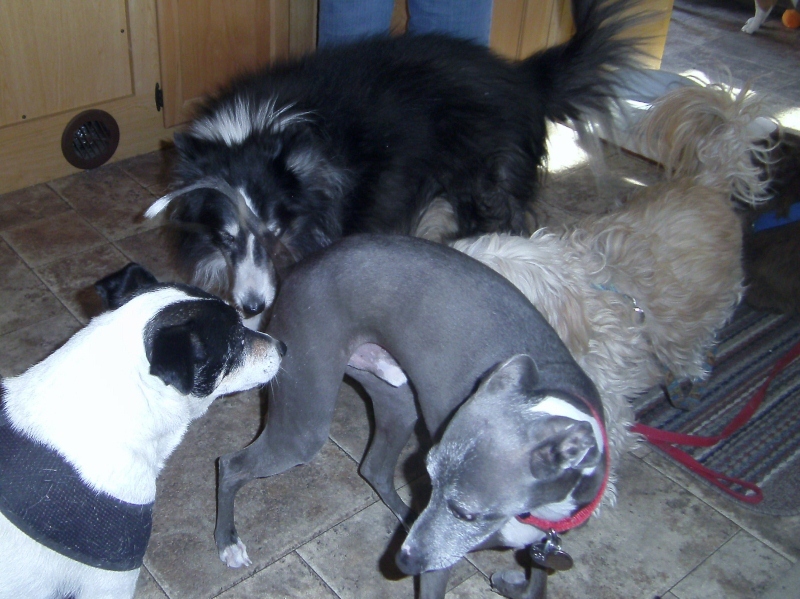 clete and Chris were the ones with the Italian Greyhound! Ohhhh, looks like so much fun. Haven’t been to Q in years. Question, are all Casitas the same length…just laid out differently inside? Sorry, I guess I have never seen your darling Casitas since we haven’t RV’ed in years. So enjoying your travels ! Just bopped over from gumo’s blog. Have camped around Q many times in the past. Always good people around. After avoiding Q for several years to save myself money and space (I collect rocks and beads) I’m heading there next week for some “looky lou”. Enjoy your time in the desert. You enjoy your time here, too. Have you decided to name your Casita the Perfect Little Trailer (PLT)? Sounds good to me! Have fun at Q. The PTV and the PLT? I think I like it! Or you could name it “Best Little Trailer” … the BLT! You gotta BEEF with that? Oh…I like that too!!!! The BLT…my sister lives in the BLT!!!! Hello, Karen, and welcome to my blog! If you read my entire blog, including comments, you deserve a medal! I’m very happy that you enjoy it and are getting something worthwhile from it! Wow! A lot happened before September and a whole lot more after . . . I don’t close the comments section; wordpress does that after some time has passed. It’s a good thing because I like to read every comment and reply, if I can, and the comments under the older posts … well, sometimes I miss them. 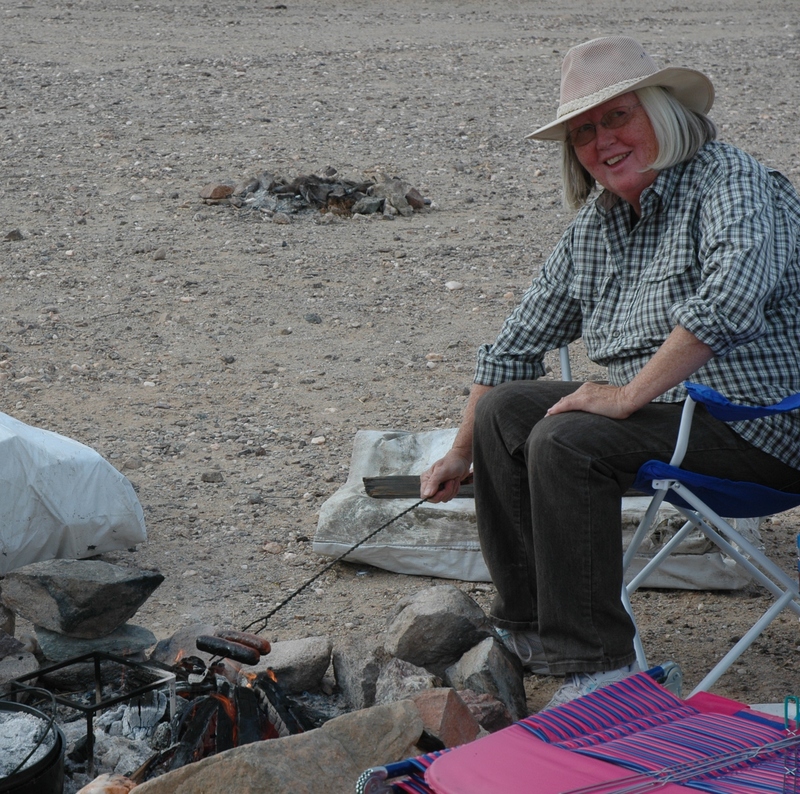 Chuck and I were so glad you decided to visit Quartzsite with us! It really was fun wasn’t it?? WoW! Now we gotta save up $$$ for next year! haha!